The first definition describes a planar curve, that extends in both of the perpendicular directions within its plane; the groove on one side of a record closely approximates a plane spiral (and it is by the finite width and depth of the groove, but not by the wider spacing between than within tracks, that it falls short of being a perfect example); note that successive loops differ in diameter. In another example, the "center lines" of the arms of a spiral galaxy trace logarithmic spirals. quite explicitly, definition 2 also includes a cylindrical coil spring and a strand of DNA, both of which are quite helical, so that "helix" is a more useful description than "spiral" for each of them; in general, "spiral" is seldom applied if successive "loops" of a curve have the same diameter. In the side picture, the black curve at the bottom is an Archimedean spiral, while the green curve is a helix. The curve shown in red is a conic helix. A two-dimensional spiral may be described most easily using polar coordinates, where the radius r is a monotonic continuous function of angle θ. The circle would be regarded as a degenerate case (the function not being strictly monotonic, but rather constant). 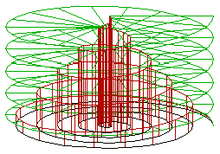 The involute of a circle (black) is not identical to the Archimedean spiral (red). Two different kinds of spiral over the surface of a sphere. A rhumb line (also known as a loxodrome or "spherical spiral") is the curve on a sphere traced by a ship with constant bearing (e.g., travelling from one pole to the other while keeping a fixed angle with respect to the meridians). The loxodrome has an infinite number of revolutions, with the separation between them decreasing as the curve approaches either of the poles, unlike an Archimedean spiral which maintains uniform line-spacing regardless of radius. where n is the index number of the floret and c is a constant scaling factor, and is a form of Fermat's spiral. The angle 137.5° is the golden angle which is related to the golden ratio and gives a close packing of florets. An artist's rendering of a spiral galaxy. Sunflower head displaying florets in spirals of 34 and 55 around the outside. Potassium sulfate forms a spiral structure in solution. A spiral like form has been found in Mezine, Ukraine, as part of a decorative object dated to 10,000 BCE. This Petroglyph with a spiral figure carved into it was made by the Hohokams, a Native American tribe in the United States, over 1000 years ago. The spiral and triple spiral motif is a Neolithic symbol in Europe (Megalithic Temples of Malta). The Celtic symbol the triple spiral is in fact a pre-Celtic symbol. It is carved into the rock of a stone lozenge near the main entrance of the prehistoric Newgrange monument in County Meath, Ireland. Newgrange was built around 3200 BCE predating the Celts and the triple spirals were carved at least 2,500 years before the Celts reached Ireland but has long since been incorporated into Celtic culture. The triskelion symbol, consisting of three interlocked spirals or three bent human legs, appears in many early cultures, including Mycenaean vessels, on coinage in Lycia, on staters of Pamphylia (at Aspendos, 370–333 BC) and Pisidia, as well as on the heraldic emblem on warriors' shields depicted on Greek pottery. Spirals can be found throughout pre-Columbian art in Latin and Central America. The more than 1,400 petroglyphs (rock engravings) in Las Plazuelas, Guanajuato Mexico, dating 750-1200 AD, predominantly depict spirals, dot figures and scale models. In Colombia monkeys, frog and lizard like figures depicted in petroglyphs or as gold offering figures frequently includes spirals, for example on the palms of hands. In Lower Central America spirals along with circles, wavy lines, crosses and points are universal petroglyphs characters. Spirals can also be found among the Nazca Lines in the coastal desert of Peru, dating from 200 BC to 500 AD. The geoglyphs number in the thousands and depict animals, plants and geometric motifs, including spirals. Spirals are also a symbol of hypnosis, stemming from the cliché of people and cartoon characters being hypnotized by staring into a spinning spiral (one example being Kaa in Disney's The Jungle Book). They are also used as a symbol of dizziness, where the eyes of a cartoon character, especially in anime and manga, will turn into spirals to show they are dizzy or dazed. The spiral is also found in structures as small as the double helix of DNA and as large as a galaxy. Because of this frequent natural occurrence, the spiral is the official symbol of the World Pantheist Movement. The spiral is also a symbol of the dialectic process and Dialectical monism. ^ a b "Spiral, American Heritage Dictionary of the English Language, Houghton Mifflin Company, Fourth Edition, 2009. ^ Thompson, D'Arcy (1942) . On Growth and Form. Cambridge : University Press ; New York : Macmillan. ^ Prusinkiewicz, Przemyslaw; Lindenmayer, Aristid (1990). The Algorithmic Beauty of Plants. Springer-Verlag. pp. 101–107. ISBN 978-0-387-97297-8. Archived from the original on 2007-05-19. ^ Thomas, Sunil (2017). "Potassium sulfate forms a spiral structure when dissolved in solution". Russian J Phys Chem B. 11: 195–198. doi:10.1134/S1990793117010328. ^ a b "Newgrange Ireland - Megalithic Passage Tomb - World Heritage Site". Knowth.com. 2007-12-21. Archived from the original on 2013-07-26. Retrieved 2013-08-16. ^ For example, the trislele on Achilles' round shield on an Attic late sixth-century hydria at the Boston Museum of Fine Arts, illustrated in John Boardman, Jasper Griffin and Oswyn Murray, Greece and the Hellenistic World (Oxford History of the Classical World) vol. I (1988), p. 50. ^ "Rock Art Of Latin America & The Caribbean" (PDF). International Council on Monuments & Sites. June 2006. p. 5. Archived (PDF) from the original on 5 January 2014. Retrieved 4 January 2014. ^ "Rock Art Of Latin America & The Caribbean" (PDF). International Council on Monuments & Sites. June 2006. p. 99. Archived (PDF) from the original on 5 January 2014. Retrieved 4 January 2014. ^ "Rock Art Of Latin America & The Caribbean" (PDF). International Council on Monuments & Sites. June 2006. p. 17. Archived (PDF) from the original on 5 January 2014. Retrieved 4 January 2014. ^ Jarus, Owen (14 August 2012). "Nazca Lines: Mysterious Geoglyphs in Peru". LiveScience. Archived from the original on 4 January 2014. Retrieved 4 January 2014. ^ Harrison, Paul. "Pantheist Art" (PDF). World Pantheist Movement. Retrieved 7 June 2012. ^ Israel, Nico (2015). Spirals : the whirled image in twentieth-century literature and art. New York Columbia University Press. pp. 161–186. ISBN 978-0-231-15302-7. Xu, L., Mould, D., 2009. Magnetic curves: curvature-controlled aesthetic curves using magnetic fields. In: Deussen, O., Hall, P. (Eds. ), Computational Aesthetics in Graphics, Visualization, and Imaging. The Eurographics Association . A. Kurnosenko. Applying inversion to construct planar, rational spirals that satisfy two-point G2 Hermite data. Computer Aided Geometric Design, 27(3), 262–280, 2010 . A. Kurnosenko. Two-point G2 Hermite interpolation with spirals by inversion of hyperbola. Computer Aided Geometric Design, 27(6), 474–481, 2010. Thomas, S. Potassium sulfate forms a spiral structure when dissolved in solution. Russ. J. Phys. Chem. B (2017) 11: 195. Ziatdinov, R., 2012. Family of superspirals with completely monotonic curvature given in terms of Gauss hypergeometric function. Computer Aided Geometric Design 29(7): 510–518 . Ziatdinov, R., Miura K.T., 2012. On the Variety of Planar Spirals and Their Applications in Computer Aided Design. European Researcher 27(8–2), 1227-–1232 . Wikimedia Commons has media related to Spiral. 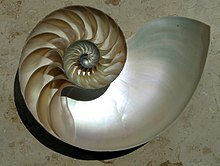 Spirals – an Encyclopedia of Life collection with examples of spirals in nature. Educational webpage connecting spirals to nature, art and patterns.